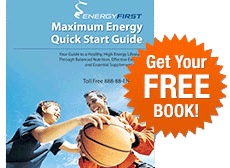 Are you new to Energyfirst? Our Get Started Sample Kit is the perfect way to sample our most popular products. Our individual serving travel packs are also perfect for replacing meals in the office, in the car, on a plane, or anywhere that you don't have easy access to your 2 pound ProEnergy canister. These are especially valuable when combined with the EnergyFirst Blender Bottle. Purchase 50 travel packs for a 10% discount! Get 5-7 Servings of Vegetables! Sugar Free, Gluten Free and Made with Certified Organic Ingredients! Prefuel Travel Pack All Natural, Sugar Free, Great Tasting Pre-Workout Energy Drink! 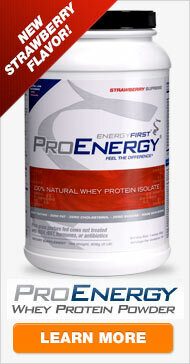 All Natural, Sugar Free, Great Tasting Pre-Workout Energy Drink!